Whether you prefer to make a reservation through our website or by a phone call, we are happy to provide you with easy and efficient steps to make your vacation plans. 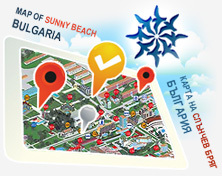 Pick out your preferable apartment/villa or resort from the provided selection by RentalBulgaria.com, complete the reservation form and e-mail it to the Rental Bulgaria Reservations Team. Kindly send us different forms if you would like to make reservations for different resorts and apartments. You will be shortly informed of the availability of the requested unit within 24 - 48 hours. In case your requested apartment/resort is not available, our professional team will offer you an alternative for your preview. We will send you booking confirmation – number of the requested units, full information of passengers' details, dates, rates, inclusions. At the same time, we also ask for a 10% deposit or fully prepaid amount for your booking, depending on payment deadline of the specific booking. The prepayment should be made by bank transfer, if you fail to complete the payment since you have received the confirmation, your booking will automatically be cancelled without any other notice within 48 hours as mentioned in Step 3. Once we receive the payment, we then send you an "Invoice" issued by Property Management Services Ltd, the owner of RentalBulgaria.com, which you must print and keep for your arrival in Bulgaria or save for your accounting purpose. The final payment ( if you haven’t fully prepaid for your stay and made just a deposit of 10%) should be made at your arrival or the day after (for late arrivals) in the closest office of ours in Sunny Beach after showing the Invoice for paid deposit issued by us and sent to you earlier .